Have you found your students struggle to latch on to writing or that they somehow just don't loooove it? This week, we had a training that really spoke to me. I have always loved teaching writing, and actually I love writing myself, but through a book we read, Writers ARE Readers by Lester Laminack and training on running Writer's Workshop, I felt like I was leaving with a big ah-ha moment for the teachers I work with. At the end of the sessions, I discussed sharing the ideas on my blog, and our division level coach thought it was a good idea, so I thank her for sharing all of the great information. Teachers who wish to implement a workshop approach would want to have about an hour of time blocked off. If the time has to be split, then the best place to divide the block is after the mini lesson. I know in my school, there are some grade levels that just do not have uninterupted time for both reading and writing. Ideally, you'd want the block to flow from one to the other though versus two isolated blocks. As you plan out your mini lesson, one important thing to keep in mind is your location. Believe it or not, that is really important because as you run your mini lessons, you're building your writing community. 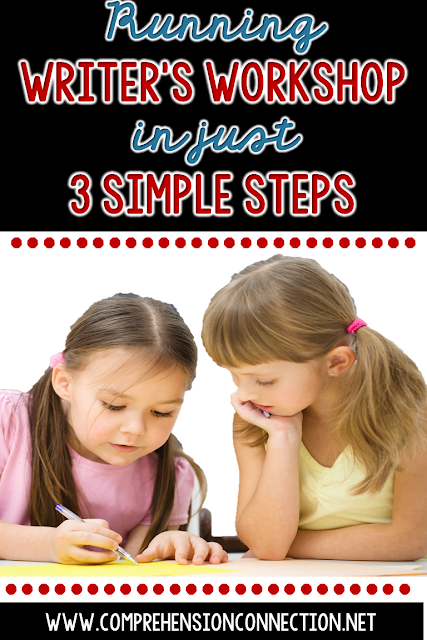 One of the biggest benefits of a workshop model is the dialogue you get with your kids. The feedback students get and give to each other is excellent once the kids feel comfortable. Students really put themselves out there when they give and receive feedback on their pieces. In fact, sometimes, there pieces can be very personal. As we run our mini lessons, we set the stage for making the community safe for thoughtful communications which leads to growth. Because our goal is to build a comfortable community, we need kids in a comfortable place (not in desks, but rather, on a cozy rug. Up close and personal is best. This would mean in a sharing area such as around a "share chair" on a rug near your Smartboard and/or chart stand. I have found this very helpful because the proximity typically means better attention and engagement too. 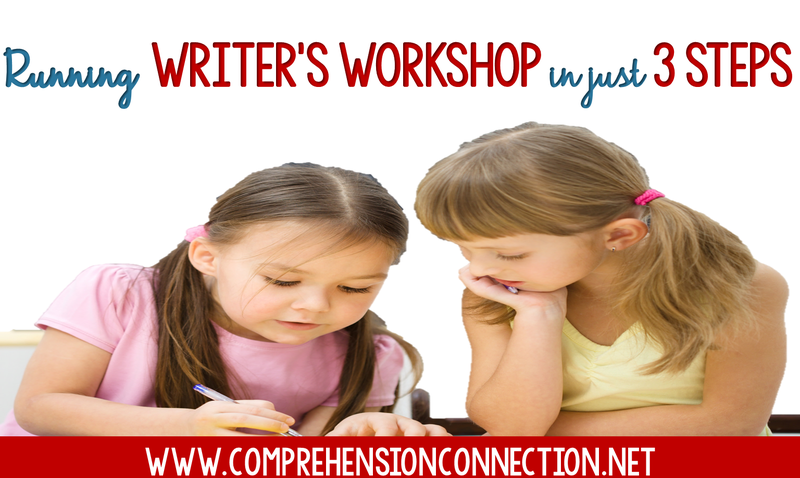 If you think about it, writer's workshop follows the I Do, We Do, You Do pattern. Once the mini lessons are complete, students are ready to dig in and work. With a workshop model in its truest form, the students choose what they want to work on. Your students may have multiple pieces in progress. They may opt to abandon a piece that they're not "hooked on", or they can choose to take piece all the way through the writing process. This means that your students may be at different places in the writing cycle and will be working on writing for different purposes. You may also find that your kids work best in flexible places. I used to have kids who liked working on Google docs with laptops we have. They'd beg me to work in our reading nook, and I was always so impressed with how well they managed their time. It was never a problem. You may find bath mats or beanbag chairs handy. Kids might also like using lapdesks. What does the teacher do during this time? Trust me...you will be busy! Yes, this is the time you will be conferring with your students. Several students may be needing to confer at the same time, so you always have the option of having them confer with another student first. As you think about these moments, you might find a checklist helpful. You can also use a recording form to make note of what your students are working on just to keep a pulse on how things are going and what you may wish to weave into mini lessons. I loved this checklist from Julie Shope on Teachers Pay Teachers. 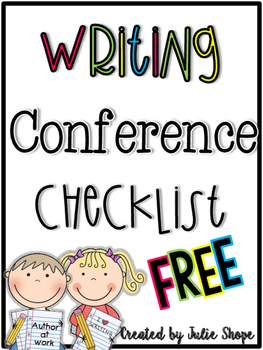 You can keep a running list of conference notes which can be pulled out at parent-teacher conferences or with the student to discuss progress. To download the checklist, just click the image to the left. The final stage in the workshop model is sharing. As I've been composing this post, I've thought about the three stages, and honestly, I do not think there is one that is more important than the others. Kids want and need praise for their hard work. To me, the best way to show our students how important their hard work is by displaying it. You truly can tell a lot about a classroom when you walk in and see it overflowing with kid work. I just love it. One thing to keep in mind with student work is that not every piece needs to be published with a pretty cover and ribbon. In fact, you might just keep a writing binder of the pieces and let the students choose if they want to polish one to this level. Others can be kept as a portfolio of work for progress monitoring. When you begin sharing times, you may find a few students feeling a bit overwhelmed. For these, one suggestion is to start sharing time in a small group. Kids are used to being pulled for small groups already, so having a writing group for feedback might be just what the doctor ordered. Did I read your mind? Teachers do seem to get very concerned about grading, and with writing, the best way to evaluate is with a rubric. Using anchor papers with your mini lessons will help your students understand the requirements of a 4 paper, but certainly, I'd outline your expectations for grading. You might give your students a required number of finished pieces as a target each grading period just to keep them from becoming repeat abandoners. Have a wonderful weekend, readers, and again, if you are curious about this, please feel free to leave your questions in the comments below. As always, I love this post! I saw Lester Laminack at a reading conference once and was so inspired! I will need to purchase his book. I agree that sharing is such an important component and is often one that many teachers forget. I have learned that if students do not get to share regularly, they stop writing. Thanks for continuing to inspire me with your posts! Elizabeth-That book was just awesome! I love all of the lesson ideas included in it as well as how he connects reading and writing. I can't wait to share it with the teachers in my school.